Loading directly with Globe GS99 will not go on top of your 1GB anymore. So, this trick will require you 2 Globe SIM, one for sharing and the other to be used for internet. 150 load or more depending on your data needs. Choose SHARE-A-LOAD/PROMO on the selection screen. Next, let's add the data to your Globe SIM that you are going to use. Load 50 then register to GOTSCOMBOKEA37 or GOCOMBOIKEA35 to 8080 this will add 1GB to your data. Now you have 1.2GB with 1 month expiration. 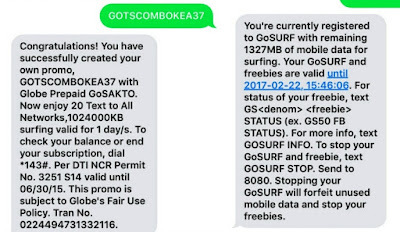 You can add more data by texting GOTSCOMBOKEA37 to 8080 every 10 minutes interval. You can extend the validity of GOSURF99 just follow the same procedure. Do this 1 day before expiration. 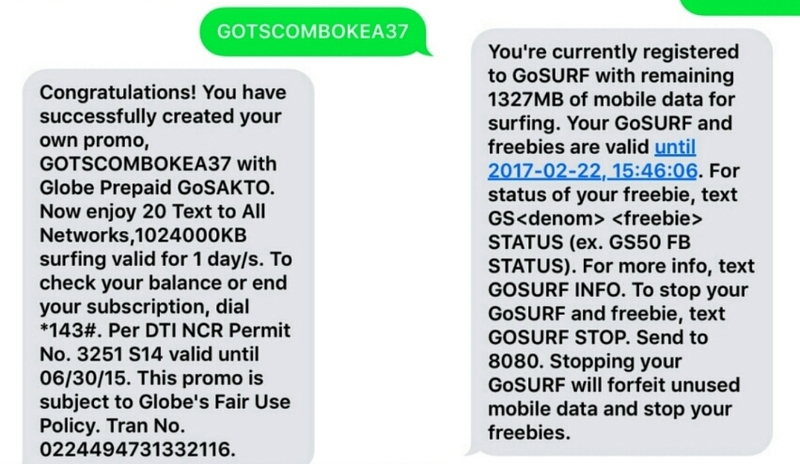 Do not register directly to GOSURF99 because the 1GB will only last 1 day. You can also try GOCOMBOIKEA35 it's the same as GOTSCOMBOKEA37 cheaper. Peggo Music Downloads is one of the best app to download music. This is a nice article.